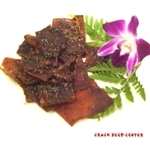 Hawaiian Fish Jerky is local favorite!!! It is dried fish with an explosion of onion and pepper flavors that keep our customers coming back for more. If you like jerky, try our Clam Jerky.